Welcome to Pali Plumies a website dedicated to the promotion of growing beautiful tropical plants even in the hot deserts of Arizona. Our primary goal is to promote growing Plumeria trees by sharing with everyone our experiences of growing these beautiful trees. We hope that the information provided here will give hobbyists and gardeners an opportunity to experience how easy it really is to grow plumerias. We hope that you will learn from this information and experience your own little backyard paradise. Our information is free to everyone, and you are welcome to learn from it. One look at the flowers of the plumeria tree and you will know what is the most significant meaning of these trees is. Yes, it is sure beauty, charm and grace. Plumeria flowers with their beautiful colors and fragrance symbolize natural beauty. Secondly, plumeria flowers represent spring and new life. They are also associated with beginning or birth of something. Plumeria flowers have a special meaning in the Hawaiian culture as it symbolized everything good in it. So create a tropical paradise right in your own backyard. Plumeria or Frangipani are famous for the Lei flowers they produce. It is native to warm tropical areas of the Pacific Islands, Caribbean, South America and Mexico. Luckily for us, the beautiful flowering Plumeria trees can be grown just about anywhere. Known for their beautiful flowers and amazing fragrance, you can have a little piece of paradise right in your own backyard. Plumeria (common name Frangipani) is a genus of flowering plants of the family Apocynaceae (Dogbane Family). It contains 7-8 species of mainly deciduous shrubs and small trees. They are native to Mexico, Central America, the Caribbean, and South America as far south as Brazil but have been spread throughout the world's tropics. Plumeria is related to the Oleander, Nerium oleander, and both possess an irritating, milky sap, rather similar to that of Euphorbia. Contact with the sap may irritate eyes and skin. Other related family memebers of Apocynaceae (Dogbane) family include; Adenium, Carissa (Natal Plum), Mandelvilla, Nerium (Oleander), Thevetia (Yellow Oleander) and Trachelospermum (Star Jasimine). Each of the separate species of Plumeria bears differently shaped alternate leaves, with distinct form and growth habits. The leaves of P. alba are quite narrow and corrugated, whereas leaves of P. pudica have an elongated shape and glossy, dark-green color. P. pudica is one of the everblooming types with non-deciduous, evergreen leaves. Another species that retains leaves and flowers in winter is P. obtusa, though its common name is "Singapore," it originates from Colombia, South America. Plumeria flowers are most fragrant at night in order to lure sphinx moths to pollinate them. The flowers have no nectar, and simply dupe their pollinators. The moths inadvertently pollinate them by transferring pollen from flower to flower in their fruitless search for nectar. 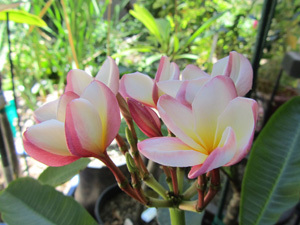 Plumeria species may be easily propagated from cuttings of leafless stem tips in spring. Cuttings are allowed to dry at the base before planting in well-drained soil. Cuttings are particularly susceptible to rot in moist soil. Propagation can also be by tissue culture from cuttings of freshly elongated stems or aseptically germinated seed. Pruning is best accomplished in the winter for deciduous varieties, or when cuttings are desired. There are more than 300 named varieties of Plumeria.